LOCATION.--Lat 41`59'31", long 80`17'29", Erie County, Hydrologic Unit 04120101, on left bank 100 ft upstream from highway bridge on Tannery Road, 0.5 mi upstream from mouth, and 1.8 mi southeast of Girard. PERIOD OF RECORD.--May 1986 to current year. GAGE.--Water-stage recorder. Elevation of gage is 800 ft above National Geodetic Vertical Datum of 1929, from topographic map. COOPERATION.--Funding for the operation of this station is provided by the Pennsylvania Department of Environmental Protection. 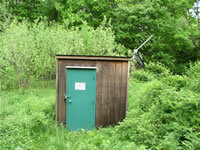 This station managed by the PAWSC Pittsburgh Field Office.